Happy Bloggers Challenge Friday, I hope you've been having a good week! This weeks Bloggers Challenge Theme is Birthday's. Yep, you've guessed it, I'm in need of a BD card, so I issued the challenge. DH's BD is Saturday, no big plans to celebrate...We bought him a few DVD's and a CD, so it will probably be a movie marathon weekend at our house. 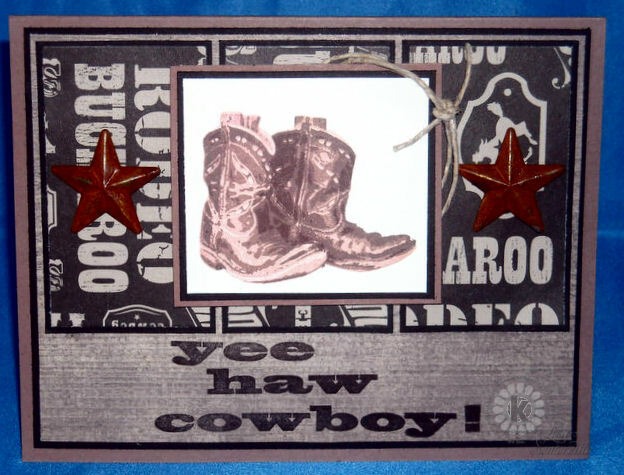 All images are from Kitchen Sink Stamps Multi Step Cowboy Boots, they make for some great masculine cards. Don't forget you can save 10% on all your KSS purchases, just click here, the discount will automatically be applied to your cart. Looking for more Birthday inspiration, click on the Bloggers Challenge Logo on my sidebar to see what the other players created this week. I hope you and your family have a great birthday celebration for your husband. This is a great man card. I love the boots and the sentiment. Happy birthday to Jim! Hope you all have a wonderful celebration. Your card is a perfect start for that celebration...love the cowboy theme!! That sure says fun and more fun, great card! Hope you all have a great weekend. Absolutely a fun guy card! The movie weekend at home is a great way to celebrate! Have fun! These boots are great, and I LOVE the lasso and star accents too :-D! Thanks for the heads up on my win at Scrap-Mart! I'm delighted to say the least!! Your card for your DH is really cool with those awesome boots! I'm also amazed with the awesome Tim tags you've been making! You're right on the money with each one!! Gorgeous! Wonderful card, Lisa. Not as many cards for big guys and little guys and this one is perfect! Excellent imagery, and beautifully created. Ohhh cool background and great card and stars Lisa! Hope Jim has a Happy birthday! Wonderful card. The boots look awesome against the background. Great Birthday card. Love the cowboy theme! Great masculine birthday card, Lisa! Your embellishments are perfect for the western theme.